Fabian Bonasera's son, left, peers at cat Korben Dallas. Naveen Rajur, right, loves his dog Maddie. (CNN) -- Do you rejoice at the sound of barking but cower at a meow? Or do you look at a cat and feel an instant sibling-style connection? With the proliferation of Web sites cultivating photos and videos of animals doing cute things, it's easier than ever to get your daily fix of the pet variety you have, or wish you had. Ever wonder what your preference for cats or dogs says about you? To love cats, you have to be able to love things for themselves; they have their own life, they aren't necessarily dependent on you. Your dog kind of lives for you. Dog people scored significantly higher on extraversion, agreeableness and conscientiousness measures, and lower on neuroticism and openness than cat people, the survey found. The effect persisted regardless of gender of the respondent. "Once you know the findings, it kind of falls into place," Gosling said. "You think, 'of course, agreeableness and extraversion -- dogs are companionable, they hang out, they like to be with you, they like your company, whereas cats like it for as long as they want it, and then they're off." But this foray into your deeper pet subconscious isn't the final word, Gosling says -- after all, if the findings had been reversed, they would also make sense to some people. These are, of course, generalizations and don't apply to every individual. "It means that if you knew nothing else about them, that would be your best guess," he said. 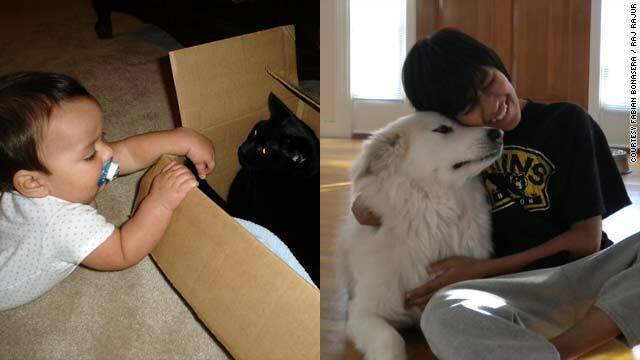 The findings do make sense to 12-year-old Naveen Rajur, a "loving dog boy" in Andover, Massachusetts, who considers dog people to be outgoing and active. He also agrees about the agreeableness and conscientiousness of dog people because they "always have to want to take care of the dog and always kind of be by its side." Fabian Bonasera of Norcross, Georgia, who must give away his two cats soon because he and his wife and son are moving to Iceland, said the cat findings are about half-true of himself -- he considers himself laid-back and easy-going rather than neurotic, but the "openness" does resonate with him. "They just like something a little more soft, more gentle," he said of cat people. "They're good pets, they're more independent, they do their own thing." Cat rescue volunteer Eddye Sheffield, of Gadsden, Alabama, said she's seen all kinds of cat owners, and can't pin down personality traits that apply to all cat people. Outsiders might label Sheffield herself a "crazy cat lady" because she has 11 cats, she said, but she doesn't view herself that way. "All of them are rescued cats and they need a place to go, and I had room, that's how I ended up with that many," she said. Owning that many has also gotten her more involved in rescue efforts, which has put her into more contact with other people, not less (score one for extraversion). Veterinarian David Bessler, senior emergency clinician at NYC Veterinary Specialists in New York City, said he was a dog person growing up, but that owning a cat has "converted " him. It hasn't changed his personality, but he can imagine that dog people and cat people have personality differences. "To love cats, you have to be able to love things for themselves; they have their own life, they aren't necessarily dependent on you," he said. "Your dog kind of lives for you." Participants in Gosling's study were recruited to the study through search engines, portal sites, voluntary mailing lists, and word of mouth from other visitors. The study will appear in the journal Anthrozoos in September 2010. The findings are useful for identifying the right pet for a particular person, and for pet therapies, Gosling said. Is it that people choose pets that are like them, or that pets change people over time? Research has not come to a conclusion on this question, experts say. Beyond personality characteristics, people may have physical features in common with the animals they like or own. A study by University of British Columbia psychologist Stanley Coren found that women with long hair liked Springer spaniels and beagles, which have long ears, and women with short hair liked the short-eared basenjis and huskies. A study by Michael Roy and Nicholas Christenfeld found that participants could match photographs of owners to their purebred dogs about 67 percent of the time, based on appearance alone. Results suggested that the owners selected dogs that looked like themselves and did not grow to look like the dogs over time, as there was no relationship between how long the people had lived with the animals and how similar they looked. Both of those studies are mentioned in an upcoming book called "Some We Love, Some We Hate, Some We Eat: Why it is So Hard to Think Straight About Animals" by Hal Herzog, professor of psychology at Western Carolina University. Herzog told CNN there are plenty of reasons why a cat person would own a dog, or vice versa: allergies as well as other lifestyle factors, such as space for the animal, come into play. Herzog and his wife consider themselves dog people, but own a cat, Tilly, because they can easily leave her alone when they go away for the weekend. Although he appreciates cats, he does not feel that owning one has changed his personality. But, Tilly is fairly social for a cat, he said, which may have something to do with how she was raised. Empty-nesters such as Herzog and his wife, as well as retirees, are among those increasing pet ownership in America, he said. About 37 percent of American households have dogs and 32 percent have cats, but the cat population (82 million) is significantly higher than the dog population (72 million), said Herzog, citing 2007 data from the American Veterinary Medical Association. That's because people tend to own multiple cats, as they are more amenable to many people's lifestyles, he said. People tend to gravitate toward the animals they were raised with, Herzog said. Cat owners tend to be raised in cat families, and dog owners tend to be raised in dog families. In fact, one study found the animal you like is the one your grandparents lived with, he said. The field of anthrozoology, the study of how animals and people relate to one another, only recently took off, Herzog said. "I think our interactions with animals shed a lot of light on larger issues in human psychology," he said. "With pets it's things like attachment and why we're altruistic toward other creatures, especially creatures that we're not genetically related to."